Growing up in the South, one learns some important summertime norms. No seersucker before Memorial Day. Never drive a convertible with the top down and the windows up. Get a pedicure before you wear flip flops. Okay, that last one wasn’t something my father taught me, but it’s definitely a worthwhile piece of advice. One thing my father did impress upon me was that come summertime a man should switch from dark to clear spirits. Every summer, I try out some trendy seasonal cocktail I’ve read about in the New York Times, but which is never made correctly and costs twelve dollars because of all the ingredients. Inevitably, I end up with a glass of white wine or a gin and tonic in hand. This summer, I decided to explore something easier: the margarita, one of the world’s most popular and most abused cocktails. Yet, if done right, it can be a wonderful mix of flavors. Spicy, earthy tequila. Sweet and zesty notes from the orange liqueur. Zing from the lime. A potent catalyst for conversation and creativity. There’s something both fascinating and appalling about a drink made with a spirit that can cost seven dollars a bottle or several hundred dollars a bottle and that’s popular in the Hamptons and the Ozarks. It’s an incongruous cocktail and that feels rather Rehobothian to me. I began my margarita summer at Mariachis. Naturally, I had to try the “Millionaire,” the most expensive ‘rita on the menu. Made with anejo (aged) tequila and Cointreau, it’s smooth and mellow. You definitely don’t feel like you’re drinking a cheap drink. The house margarita was less expensive and also tarter, but still a very fine cocktail for four dollars less. Both are what I call “sit-down” margaritas, you know, served in that traditional bowl shaped glass with green cactus stems and best enjoyed with a meal. After two of them, I had a good buzz, so clearly they’re not skimping on the tequila. Over at Aqua they serve their margaritas “stand up” style in a plastic cup that you carry around while you socialize. The best part of the Aqua margarita is watching the shirtless bartenders make it. Admittedly, I was distracted, but I did note the drink is hand mixed with tequila, triple sec, and Rose’s lime juice. If you like the taste of tequila, which I do, you’ll like this version. The margaritas at the Seafood Shack hit that sweet spot between sweet and sour. Perks you up without the pucker. Speaking of names, there are no shortages when it comes to different margarita recipes. 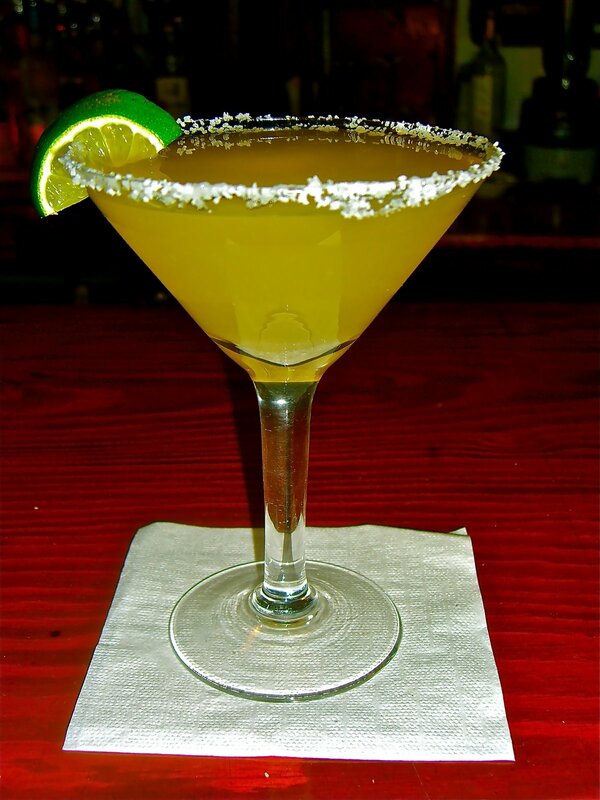 There are almost as many claims to the invention of the margarita. One story says it was created in Galveston in 1948 for singer Peggy (Margaret) Lee. A bartender in Tijuana claims to have invented the margarita in the early 1940’s as homage to actress Rita Hayworth, whose real name was Margarita Cansino when she danced in the local bars. Most historians seem to agree that while earlier cocktails were mixed using tequila, the classic margarita recipe was first mixed in Acapulco in 1948 by the wealthy Dallas socialite Margaret “Margarita” Sames. She was tired of Bloody Marys. Where do the smart set in Rehoboth go to sip their margaritas? To The Back Porch, for a polished cocktail made with high quality anejo tequila, which imparts a smooth, rich taste to the drink. The bartenders pre-mix their margaritas in batches because they swear the flavors blend better that way. I can’t disagree, as it’s one of the best “sipping” margaritas I’ve ever tasted. Served up or in a small rocks glass. In contrast, the sixteen-ounce “guzzler” at The Starboard in Dewey Beach is exactly what you’d expect from the folks who advertise that when it rains they pour. And pour they did. Twice. I still can’t figure out how the margarita tasted so sweet with so little mix. I’ll admit I’m somewhat sugarphobic, so this concoction one wasn’t among my favorites. Also on Route One is La Tonalteca. A gentleman who frequents the restaurant for its pollo and chorizo dishes introduced me to their margaritas. At $5.49 for a classic lime margarita in a real glass, it’s a great buy, and just right on a hot afternoon when you need to duck in for something cool and tart to take the edge off. They do them on the rocks or frozen or in pitchers, and in other flavors such as mango, peach, and strawberry, which I did not try. Unfortunately, I never made it to Dos Locos, the Purple Parrot, or Que Pasa. There’s only so many one man can drink. And, after only two weekends, I was suffering from reflux and having flashbacks to college girlfriends in lime green skirts embroidered with purple hippopotamuses. This had to stop.